Free Solo – The TIFF People’s Choice Award winning documentary is Held Over for a 2nd Week! 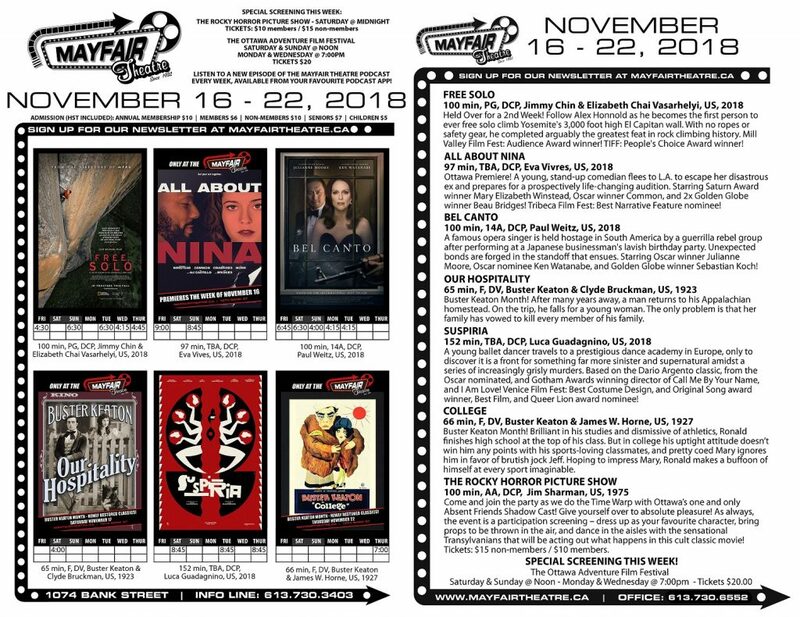 All About Nina – Ottawa Premiere of the Tribeca Film Fest nominee for Best Narrative Feature! Bel Canto – Based on the best selling novel, starring Oscar winner Julianne Moore, and Oscar nominee Ken Watanabe! Suspiria – Based on the Dario Argento classic, from the Oscar nominated, and Gotham Awards winning director of Call Me By Your Name! The Rocky Horror Picture Show – Do the time warp again with your hosts, the spectacular Absent Friends Shadow Cast! Our Hospitality and College – A pair of 1920’s classics make a rare big screen appearance as part of Buster Keaton Month! Plus, four days of The Ottawa Adventure Film Festival!